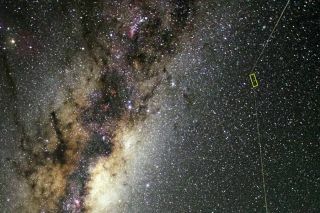 The newly identified star located within the yellow box of this image is half of a binary. Astronomers think they have identified a star they believe to be about 13.5 billion years old, which would place its birth just after the Big Bang — and it's surprisingly close to us. The new discovery suggests that our own corner of the galaxy may be older than previously calculated, and scientists hope that studying the star, called 2MASS J18082002–5104378 B, may teach us more about the early days of the universe. "This star is maybe one in 10 million," lead author Kevin Schlaufman, an astronomer at Johns Hopkins University, said in a release. "It tells us something very important about the first generations of stars." It's also an unusual star in terms of its orbit: It is tucked in the thin disk of the Milky Way and remains within the galactic plane, like our sun does, rather than orbiting away from the plane, as most stars short of metals do. Such metal-poor stars are highly sought after by astronomers because they were formed shortly after the Big Bang, before many stars could explode in supernovas and scatter heavier elements across the universe. While scientists have identified a few handfuls of these incredibly old stars, the newly identified one is much smaller, with just 14 percent the mass of our sun. They hope that the new discovery will be the first of many more observations of incredibly old stars. "If our inference is correct, then low-mass stars that have a composition exclusively the outcome of the Big Bang can exist," Schlaufman said in the release. "Even though we have not yet found an object like that in our galaxy, it can exist." The new research is described in a paper published Nov. 5 in The Astrophysical Journal.